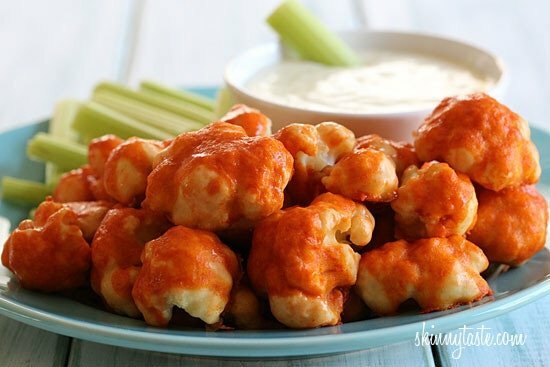 These easy, healthy Buffalo Cauliflower Bites are made in the oven, perfect for football! 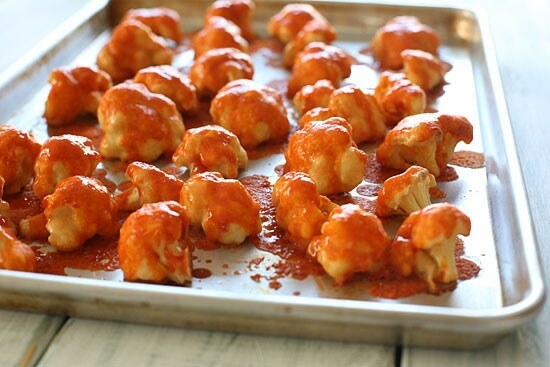 Hot and spicy cauliflower bites, battered and baked and smothered with hot sauce. Serve this with skinny blue cheese dressing and celery sticks on the side for a hot and spicy meatless appetizer. I tested it out on some of the cauliflower-averse people in my home, and they gave it a thumbs up. One thing to note, if you are watching your sodium, you’ll have to look for a lower sodium hot sauce, or use half of the sauce. Frank’s is my favorite for buffalo sauce, but it’s not low in sodium. If anyone knows of a lower sodium buffalo sauce, kindly share! Combine the water, flour, and garlic powder in a bowl and stir until well combined. Coat the cauliflower pieces with the flour mixture and place on the baking sheet; bake for 20 minutes. While the cauliflower is baking, combine the hot sauce and butter in a small bowl. 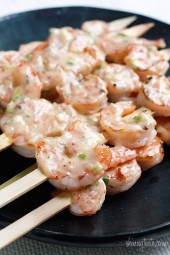 Serve with skinny blue cheese dressing if desired and celery sticks. LOVED IT. Followed the recipe to a T. Used fresh cauliflower and Frank Red Hot. Tossed them in a bowl with all ingredients. WILL FOR SURE MAKE THEM AGAIN.Total cook time 25min and still had crunch.Thank you. These were delicious! I used Earth Balance butter instead because my husband is lactose intolerant, but otherwise, followed the recipe as is. I wonder if I could do this in the air fryer….. I just made these with almond flour , then used clarified butter, sriracha and a touch of BBQ sauce for the topping. SO GOOD! Sriracha sauce has less sodium, but I don’t know if it would work with this recipe. 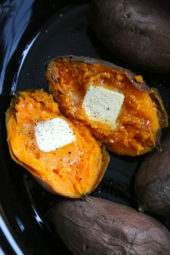 Do you know how to translate this to the air fryer? I used a cup of kodiak cake mix instead of flour. turned out great! Cooking advice on getting cauliflower crispy? I followed the directions and it was soft/soggy. Trader Joe’s has a hot sauce called Chili Pepper Sauce that has 0mg sodium…it is very good and I use it all the time for my Buffalo Chicken, Buffalo Cauliflower and Buffalo Brussels Sprouts. I make these but I substitute coconut oil for the butter, and I use frank’s original as I can’t tolerate the xanathan gum in frank’s buffalo sauce. YUM!!! I was wanting to use this as a side dish for dinner but i don’t know what to pair it with. Any ideas? I made turkey burgers with it no buns. OMG….Sooooo delicious!!!!! Thank you! Only thing I did differently was brush the hot sauce mixture on rather than pour the whole amount on, so I didn’t need the whole cup. Everyone raved! These are fantastic, first time I made them followed the instructions exactly and they turned out great. Second time, I pulled the cauliflower off the pan and tossed them in the sauce before cooking another five minutes. I would not suggest doing this, while they were still good, tossing them in the sauce took away some of the crunch to them, stick with drizzling the buffalo sauce over the top. I also added some habenero hot sauce to the flour mixture before i baked it and it added that extra heat i wanted. So hard to figure out 6 1/2 Cups of Cauliflower. Does anyone know if this is 1 large head or 2 heads? Any ideas? I can’t figure out how many cups a head will give you. Can you use frozen cauliflower or does it have to be fresh? Made this last night as a appetizer before dinner. This was so tasty. My husband liked it as well but the spice was a little too much, so next time we’d probably use a little bit less hot sauce/more butter. Overall though the taste was great. Will definitely make again!!! I don’t think that they were doughy at all (like another user said) – just make sure you let the extra batter drip off. It’s just flour and water so it shouldn’t really be doughy..
Can you freeze these after cooking? We have these once a week on average. Just can’t get enough! Yummy! So glad you’re enjoying them! I made this for yesterday and LOVED it! Thank you so much for helping me stay on track through the SuperBowl festivities. PS – this is not the first time making your recipes. Keep them coming! These were amazing!!! Perfect for my low calorie WOL and perfect for my family"s eat whatever they want WOL!! Lol These will be a once a month dealio for me!! I just made them. I didn't have the right hot sauce, so I used a Srirachi BBQ sauce (Trader Joe's) with about a teaspoon of Tapatio sauce. They were delicious! We dipped in Ranch dressing, as we don't really care for blue cheese. This looks great! I want to make it this weekend. However, I have one question. Why is the sodium so high? Can I use almond flour to make this gluten free? I have used rice and coconut flour. Rice is by far the best! Use about 3/4 cup of rice flour in place of 1 cup or regular flour. These were awesome, but… Holly moly, she wasn't kidding about the sodium… I didn't even notice that the serving size on the Franks was 1 *teaspoon*, which has 190 mg of sodium. That ends up coming out to a whopping 6840 mg for the whole batch of bites (c'mon… is anyone really only eating one serving here??). For anyone who's bothered by this, tabasco only has 30 mg per teaspoon, so that would cut it quite a lot, but still equate to 1080 mg for the whole batch (I fully admit to splitting this into 2 servings and splitting with my hubby). Finally, did anyone else have a bit of trouble with the coating? I had to add quite a bit more water to make it stick (it was just too goopy and thick to stick at first). Even so, I think I'll add a bit more water to make it even thinner on the next batch. This topic may have been covered before, but I stopped reading after about 4 pages of comments! Overall, this was an awesome find, and I'll be making a low-sodium version soon! These are the best thing when you have that need for the taste of buffalo wings but no desire for the calories or fat from chicken wings. Big hit in my house! I made this the other night and could not stop eating it! Burns so good, and very addicting! This will be made again and again. And again. Aaaaand again. Does the cauliflower have to be steamed or boiled previously? Or is it fresh, uncooked cauliflower? 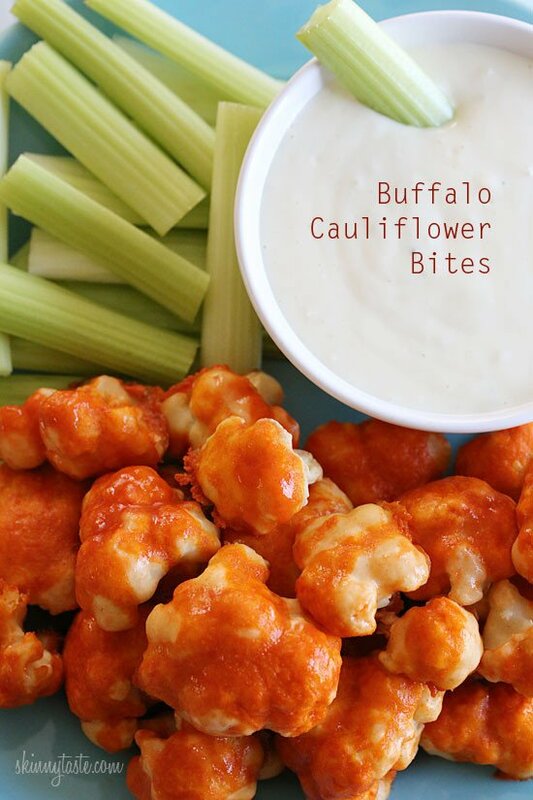 I made these last night as a Super Bowl snack and they didn't really turn out. The coating remained doughy and it completely ruined the overall taste for me. Any suggestions for next time? We had the same problem. The taste is OK, but the texture is pretty mushy. 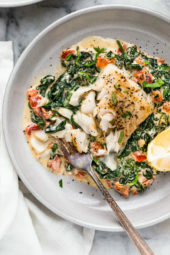 This is the only SkinnyTaste Recipe I’ve made that hasn’t turned out awesome!! I found it helpful! If you don’t like it, move on. I will say, what didn’t work well was coconut flour. Needed twice as much liquid to make it not crumbly and actually ‘coat’ the cauliflower. The taste was ok, but it wasn’t what I was expecting.